The BF157 is a offset pull, recommended for ADA openings. Supplied standard for 1-3/4" doors. Rockwood Manufacturing - RM3301-313-5HD Special Order Straight Pull- Flat Ends-48"
The secret gate latch offers casual security against someone opening a half gate or door in partitions or other short structures. 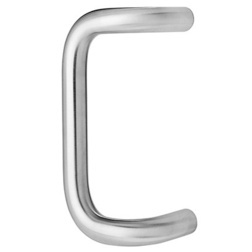 The BF157AC17 is a concealed mount offset pull, recommended for ADA openings. Supplied standard for 1-3/4" doors. 9" center to center, 10" overall height. The BF157 is a BACK TO BACK offset pull, recommended for ADA openings. Supplied standard for 1-3/4" doors.